Apollo provides an enterprise-level, high-security, high-traffic system that is at the same time scalable to suit smaller, growing systems while still having one of the most user friendly interfaces in the industry. In use at some of the most secure sites on the planet, Apollo systems have built a reputation of being reliable, robust and flexible. Apollo maintains a strong global presence in order to support its network of authorized dealers and system integrators. Software - APACS software has been developed by Apollo to take full advantage of the hardware platform in a user-friendly interface. New features are constantly being developed to address unique demands of the many industries served. Integration - A crucial part of creating a total security package, Apollo systems integrate with a wide variety of 3rd party equipment as well as providing pathways for customers to create their own packages to support any system desired. All Apollo products are manufactured in our state-of the art manufacturing facility in Newport Beach, California USA. While many of industry competitors choose to outsource manufacturing, Apollo believes in the advantage of keeping tight quality control as well as keeping design and engineering close to production. 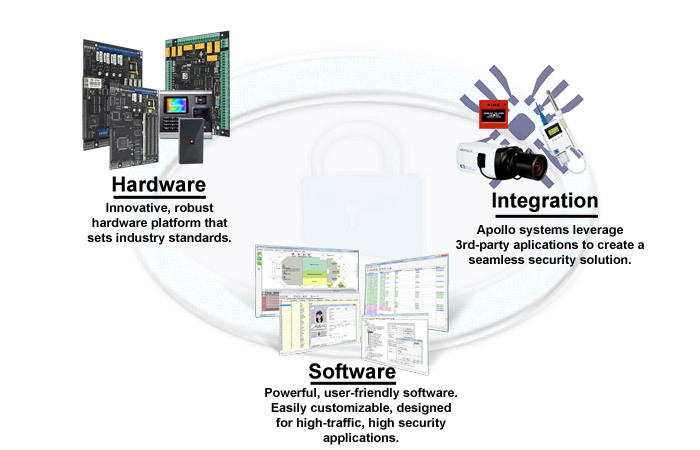 Apollo not only manufactures access control and alarm products, but also provides an extensive line of complementary security and integration products. The Product Guide contains only a sample of the complete line of accessories we supply. Contact your Apollo sales representative for information and pricing on locks, request to exit devices, additional biometric readers, wireless communications, redundant servers and other products. A major advantage of sourcing complete systems from Apollo is that they are tested by Apollo personnel for compatibility with Apollo systems. Apollo support personnel can provide guidance with the installation and support of products purchased from Apollo.